Carrot cake is by far one of our favorites! 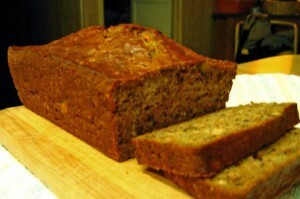 Here’s Carrot “Bread” is a typical British recipe from Mason Cash. If you bake it and follow us on Facebook, along with a “like” your impression on this page, we will send you a free King George pudding, imported directly from London! Preparation time, 10 minutes, baking time, 30 minutes. Heat an oven to 230°C/fan 210°C/gas 8. Mix the flour, salt and bicarbonate of soda in your Mason Cash mixing bowl, then stir in the carrot, walnuts and yogurt. Finally, stir in the milk and get your hands in the bowl to make a soft, sticky dough. Next, tip the dough onto a floured surface and form into a flat ball. Slash the top of the loaf and place on a baking sheet in the oven for 30 minutes until risen and cooked. The loaf should sound hollow when tapped underneath.